Many media, including the Wall Street Journal, have reported on Tianjin police chief, Wu Changshun 武長順, who seems to be following in the footsteps of Chengdu police chief Wang Lijun, 王立军 as a police officer/inventor who also ran afoul of Chinese law. The story of Wu Changshun however seems to be a bit more complicated than simply being a police chief who scammed China’s innovation system. Wang Lijun, as I blogged before, may have been profiting off of patent subsidies to file low quality patents. He had 150 patents to his name, and likely used a widespread subsidy mechanism to generate revenue and appear innovative. It is unclear if he commercialized these patents. As reported by SIPO’s newspaper, Wu seems to be of another stripe – the “scholar official” or the “inventor official.” In fact 34 of the 35 patents he obtained were transportation-related. Wu worked in 18 institutes of higher education and research institutions, including as an adjunct professor and researcher. He has credentials as an advanced engineer and he has a Ph.D. Indeed, he was developing inventions that at first glance might be useful to him in his police work – precisely the type of employee/inventor that China wants to encourage. The real trouble this may be elsewhere than in lower quality patents. For example, of the four inventions in which he is listed as the sole inventor, three involve a paneled traffic light. 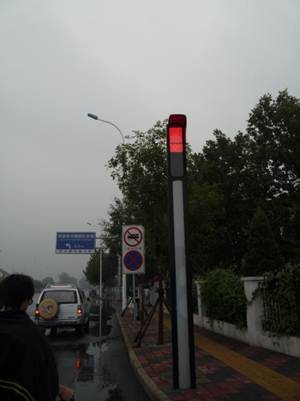 This paneled light has become a bit of an annoyance to Tianjin residents and out of town drivers, perhaps because as this picture shows, it had a unique design and functionality. The problem of Wu was not only in what he invented, but in how he commercialized his inventions. He apparently held power on certifying products for safety, standardization, as well as government procurement and through these efforts made it impossible for others to compete on Tianjin public road procurement projects where he had a personal stake. Wang abused China’s petty patent system. Many of these patents lapse after one year, because they are never commercialized. Wu, however, seems to have showed considerable creativity in how to abuse the system for commercialization of patents. His story may underscore the need for more transparent and competitive technical standards, open government procurement and clearer employer ownership/inventor rewards systems, without reference to where a product was innovated. Funny, those are some of the issues that foreigners would like to see China focus on as well…. According to a recent article by Harry Yang (杨成） at http://npc.people.com.cn/n/2014/0825/c14576-25535722.html, the NPC is discussing establishing specialized IP courts in Beijing, Shanghai and Guangzhou, based on a draft submitted by the Supreme People’s Court (SPC). The specialized IP courts are proposed to have cross-regional jurisdiction over civil and administrative IP cases related to patents, plant varieties, integrated circuit layout designs, “technical secrets” (which is not a term in the anti-unfair competition law), and “other” intellectual property rights. The SPC will enact a rule to divide the jurisdiction for each specialized IP court. The specialized IP courts will also have jurisdiction over the appeals of first instance copyright and trademark civil verdicts, as well as appeals for administrative decisions made by the local courts where the specialized IP courts are located. The Beijing IP Court will have jurisdiction over administrative IP cases decided against any administrative decision made by departments of the State Council, thus retaining – if not enhancing – their combined administrative/civil jurisdiction. Regarding appeals of the first instance verdict made by the specialized IP courts, the local People’s High Courts will have jurisdiction. The goals of the courts appear to be to strengthen IPR protection, provide greater uniformity in adjudication (much like the reasons for the CAFC) and to mitigate local protectionism. The experts took note that amongst the 90,000 IP cases of last year, there were several thousands that were more difficult. These difficult cases generally involved high technology, and were also a concern of the international community. The article also notes that certain jurisdiction issues need to be resolved involving appeals from local courts to the specialized IP courts. The article does not address outstanding subject matter jurisdiction issues – such as jurisdiction over antimonopoly law cases, or non-technical trade secrets by the specialized IP courts. On June 11, 2014, China’s State Administration for Industry and Commerce (SAIC) released the 8th Draft of its Anti-Monopoly Law/IP Rules. Panelists from the U.S. Federal Trade Commission, academia, and private practice will discuss controversial provisions of the 8th Draft—including the application of the essential facilities doctrine to intellectual property rights, liability for failure to disclose essential patents, and liability for failure to license patents found to be essential on FRAND terms—as well as possible implications, and the U.S. approach to such issues. To register, open this file: ABA Program_SAIC’s 8th Draft IP Rules_August 2014. The ABA’s comments were previously posted by me: ABA SAL-SIPL-SIL SAIC IP abuse rule comment final package. The White House Office of Science and Technology Policy recently released a blog on the results of the bilateral Innovation Dialogue with China with the Ministry of Science and Technology and other agencies: http://www.whitehouse.gov/blog/2014/08/13/outcomes-fifth-us-china-innovation-dialogue. The United States and China resolved to protect the legal rights of inventors in accordance with their respective domestic laws and regulations, and in line with their domestic laws committed to respect the rules and policies developed by employers and/or legitimate contracts between employers and inventors concerning the awards and/or remuneration of inventors. For further background see: https://chinaipr.com/2014/04/03/new-service-invention-draft-regulation-and-web-page/ . MofCOM is hosting its annual IP exchange in the United States this September 12 at the Holiday Inn on 2101 Wisconsin Avenue in Washington, DC. There is no charge for attending, but seats are limited. If you wish to attend, reserve by contacting Mr. Huangjie via huangjie@mofcom.gov.cn or 202-6253355. 2014 China’s Overseas IPR Exchange Tour in the U.S.